The Western Reserve Transit Authority is a transportation agency serving Mahoning County residents through fixed-route, scheduled and door-to-door bus service. At WRTA’s request, Farris Marketing conducted an extensive survey to learn more about the transportation needs of Mahoning County residents. Included were phone, online and written surveys. Farris designed and implemented the surveys, conducted the phone and online surveys, and provided a detailed tabulation of all results. Farris created a completely redesigned website for WRTA, developed an extensive series of videos highlighting their services, and produced print materials for various campaigns. In fall of 2017, Farris managed all aspects of a sales tax renewal campaign that resulted in this ballot issue being approved by nearly 60 percent of Mahoning County voters. In 2018, WRTA rolled out its new myStop Mobile system, which allows riders to track every WRTA bus from their smartphones, and also plan trips and receive text messages when their bus is near. Farris created a series of instructional videos that show how to download and use the system, as well as TV commercials to promote it. 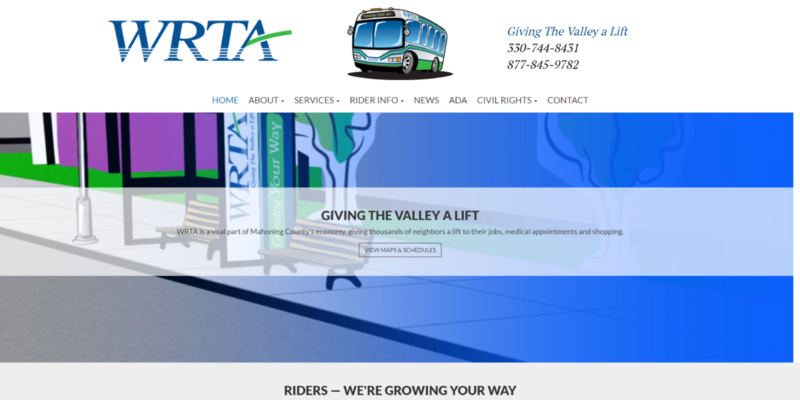 The WRTA website was updated to include access to the online version of the system.